Until I became a blogger, meatballs were something I enjoyed when someone else made them. I just found them a lot of work and messy to make. Since becoming a blogger I have written and made more meatballs than in my whole life before then. I’ve also realized everyone loves meatballs, especially my family! I am always interested in recipes that simplify the preparation of meatballs and those that make them a bit healthier. I couldn’t wait to try these baked turkey meatballs with Greek flavors and the addition of grated zucchini from Cookin’ Canuck. The grated zucchini makes the meatballs succulent. However I found the grated onion and grated zucchini added too much moisture to the meat mixture and I would recommend really drying the water out of both of these well before mixing them in. I also found the meat mixture a bit bland and added a teaspoon of dried oregano. I increased the feta from 1/4 cup to 1/2 cup. My recipe reflects the changes I made but I include the link to the original version. What I loved most about this recipe is that after just 25 minutes in the oven, you have a pipping hot dish of tasty tender meatballs in a nice red sauce to feed 6, fast enough for a weeknight, delicious enough for company. Add a side of pasta or quinoa and dinner is served! If you’re lucky enough to have leftovers, the meatballs are even better the next day. Preheat oven to 350 F when ready to bake the meatballs. In a sauce pan, heat the oil and slowly cook the onion until translucent. Add the garlic and the tomatoes then the seasonings. Bring to a boil and reduce heat and cook for 10-15 minutes until the sauce is thickened. 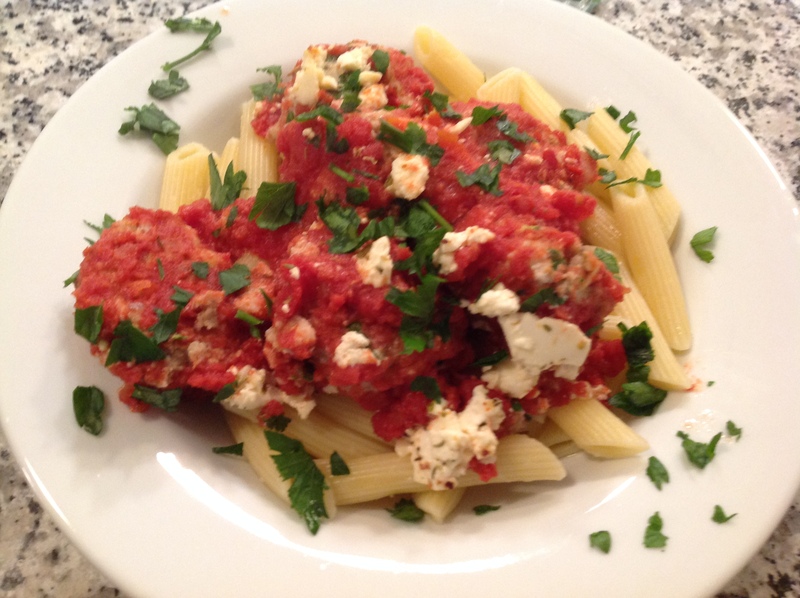 In a large bowl, mix together all the meatball ingredients except the feta and 2 tablespoons of parsley. Scoop 1 1/2 tablespoons of the meat mixture and shape into meatballs. You should get 30 meatballs. 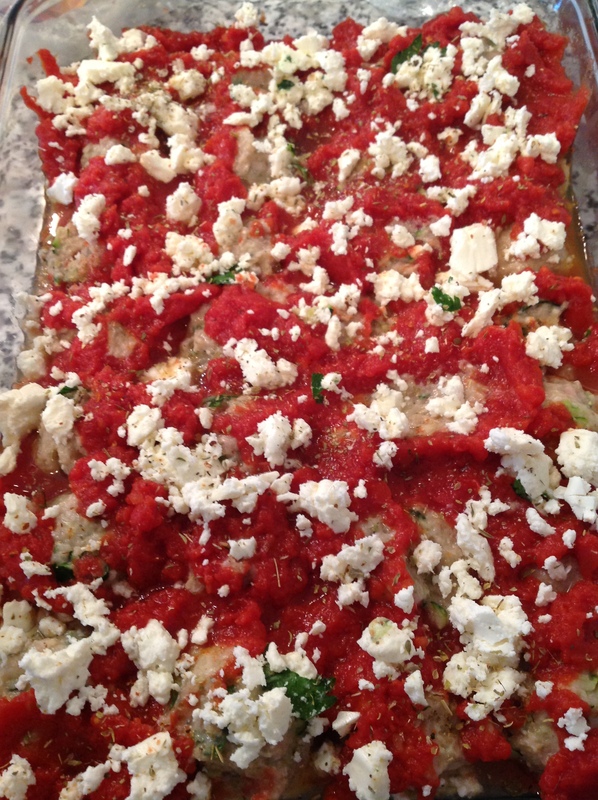 Spread one third of the sauce on the bottom of a 13 X 11″ baking dish. Line the meatballs on the sauce. Then smother them with the remaining sauce. Sprinkle the feta on top. Bake uncovered in the lower portion of the oven for 25 minutes. Sprinkle with the remaining 2 tablespoons of parsley and serve with a side of pasta, quinoa or on a hoagie roll. 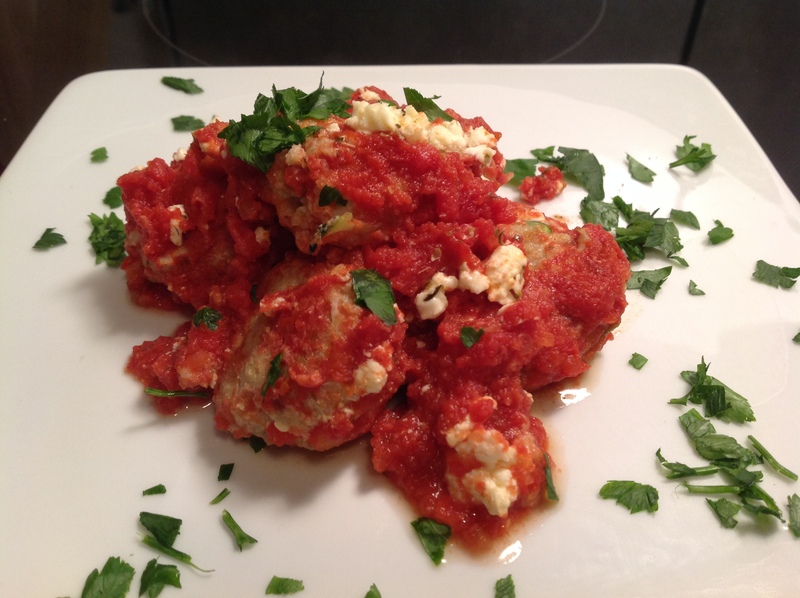 This entry was posted in Recipes and tagged baked turkey meatballs, cookin'canuck turkey meatballs, feta, Greek turkey meatballs in red sauce, ground turkey, quick tomato sauce, turkey meatballs by Johanne Lamarche. Bookmark the permalink. These meatballs look delicious! I have never tried zucchini in meatballs, but it sounds like a great idea, especially like you said, if you squeeze the water out of it before adding it to the meat. Thank you for sharing this recipe! Thank you Jenny. These meatballs were so moist and easy, baked right in the sauce! Hope your family loves them as much as mine did! I rarely make meatballs Johanne, but I think I would love the zucchini addition, I know that would add wonderful moisture and texture, not to mention the addition of feta cheese, yum! Your meatballs look so great and when topped with your sauce…divine bites of goodness! I must confess that I never make meatballs, but do love them. In our American-Dutch household, Wouter always makes them. When I come home from a photo shoot and open the door to that aromatic smell of meatballs cooking I know it will be a good dinner! He always adds nutmeg to his which must be a Dutch thing. Thanks for sharing Johanne. Lucky you to have someone ELSE make meatballs for you! Labor of love for sure Teresa. Love the addition of nutmeg in the sauce. Must try this next time. I will ask my Dutch friend about that tradition too. Hooray for all things Greek! I definitely want to try these meatballs, Johanne. They sound amazing to this lover of feta and oregano. I am a lover of all Greek foods too! Have you ever traveled to Greece? Oh my gosh, these sound wonderful! I love all the ingredients that are represented here. It sounds like the changes you made would really amp up the flavor. Saving this recipe! Thank you Shari. Such a flavorful and fresh take on pasta and meatballs. We all loved it and I hope your family does too! I absolutely love meatballs Johanne. I’ve been making Swedish meatballs lately. A jar of lingonberry jam and a cup of boiling water. Reduce together and pour over cooked meatballs placed in the slow cooker. Simmer on low for three hours. Heaven. But honestly, I’m loving the idea of using turkey and stretching that out with some zucchini as well. They would be amazing with the lingonberry reduction. Hope you are well and that it is cooling off for you. as we head into that most divine of all seasons – harvest season – apples, pumpkins, and evenings of long shadows…. That sounds fantastic Lindy, especially with a slice of your bread to sop up all the lingonberry reduction! Will give it a try. Lingonberry and thoughts turn to Ikea! One of my favorite books is set in Sweden and lingonberries abound: Astrid and Veronika by Linda Olsson. Have you read it? I love a good meatball and have had my share of blah meatballs. This sounds like a delicious one! But your spicy Mexican meatballs still rule (grrr) this household, Julie! The zucchini made the meatballs so juicy and balanced the lean turkey to keep them from drying out. Glad you liked the recipe. tried these the other night and they were a big hit with my boys! Boys and meatballs! So glad to hear it. Give those growing boys a big hug! These look great!! Now on my must make list. I have been experimenting with a chicken burger that is just too too dry when it’s up to temperature. I think I’ll have to try some zucchini in it!! I bet that would work! You always make my day when I hear from you Mollie, and it was especially uplifting to get a big dose of Mollie love today. Thank you!!! Bring it on! You made my day, and that is an undersatement today ! Johanne, I meant to tell you (before we left for Canada), that I tried this recipe with the ground turkey and zucchini from the garden. It was so healthy and those ingredients for the sauce were amazing, of course I added bits and bobs of other spices here and there. 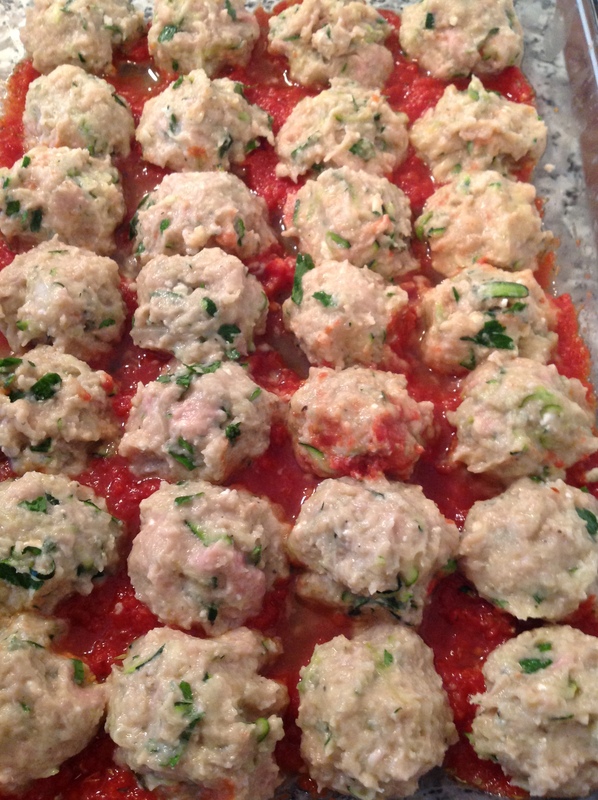 Love the idea of just baking it all in one dish instead of baking the meatballs separately. I will definitely be making this again and again. Thanks for the recipe! I am so glad to hear you enjoyed this dish too Loretta! Do check out more of Cookin’ Canuck blog. I know you will enjoy this healthy 🇨🇦 blog.